The H.H. Dorje Chang Buddha III Cultural and Art Museum is exhibiting A Rock of Horizontal Charm, an unparalleled masterpiece of Yun Sculpture. 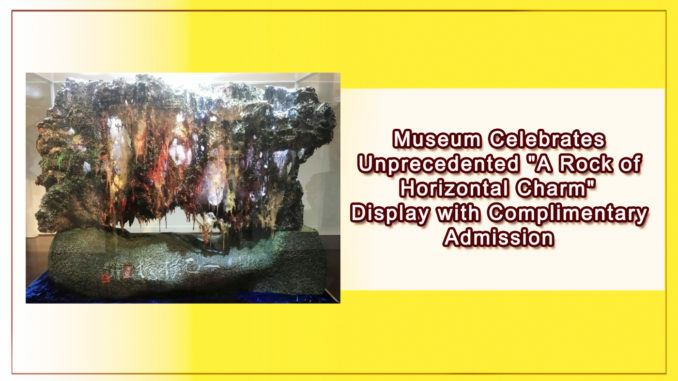 For a limited time, visitors can receive free admission to the museum and witness the unsurpassed natural beauty of the superb sculpture art first hand. The H.H. 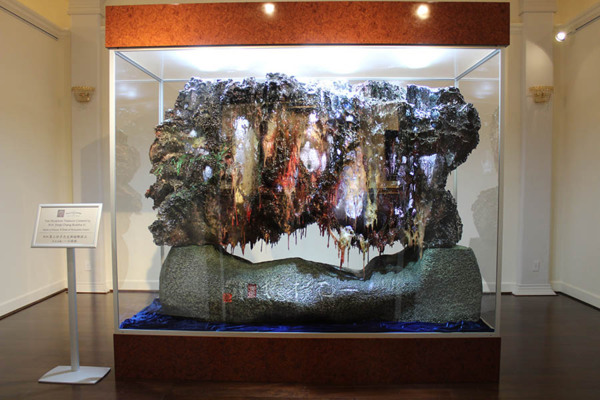 Dorje Chang Buddha III Cultural and Art Museum is pleased to announce its exhibition of “A Rock of Horizontal Charm“, a masterpiece of Yun Sculpture that embodies the spirit of art in a truly dis-tinctive way. In honor of this extraordinary form of art, the museum is offering free admission to the public for a limited time. “A Rock of Horizontal Charm” was created by the world-renowned and internationally-revered highest leader of Buddhism, H. H. Dorje Chang Buddha III. The Yun Sculpture is a piece of original artwork that expresses a unique set of qualities. Various art experts and professors who have viewed the sculpture art say it has surpassed natural beauty and represents a level of perfection that extends well beyond what can be described as superb craftsmanship or inspired artistry. When viewed from different angles, the Yun Sculpture’s colors, structure, and atmosphere change completely, inexhaustibly transforming in unpredictable ways. Furthermore, it possesses multidimen-sional spatial structures that are complex yet delicate and intricate, and exquisite to the utmost. In addi-tion, its colors—kaleidoscopic and majestic, yet mature and assured—manifest a supernatural, visionary beauty. “A Rock of Horizontal Charm“, alone, is so endlessly variegated that it provides thousands of beautiful vistas. The astounding beauty of this amazing sculpture art goes far beyond mere words. Therefore, it is no surprise that it has distinguished itself as the “emperor” of the four great Yun Sculptures. 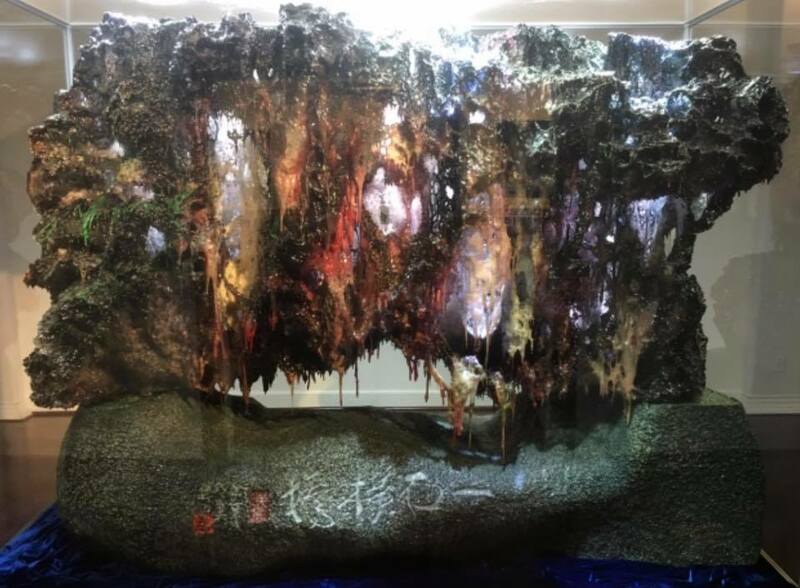 In fact, the creation of “A Rock of Horizontal Charm“ is considered to be a miracle in human history because no craftsman in the ancient or modern world—or even high technology—has been able to devise such ex-traordinary works of divine art. Consequently, this original artwork has been designated a “peerless treasure” that cannot be replicated, and the museum has named the room in which it is being displayed, Peerless Treasure. Despite an invitation to create an identical replica Yun Sculpture for a $50 million prize, no human sculpture master or technology has successfully duplicated “A Rock of Horizontal Charm“. From this, one can see how H.H. Dorje Chang Buddha lll’s artistic level has far exceeded the summit of sculptural art in human history. 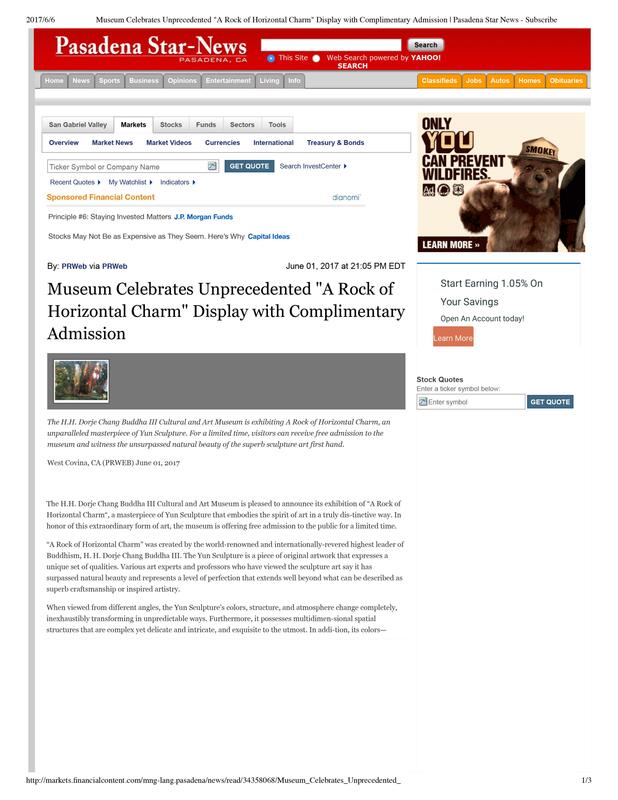 The exhibit featuring “A Rock of Horizontal Charm“ will allow visitors to experience the divine charm of H.H. Dorje Chang Buddha lll’s original artwork in person. The unreplicatable sculpture exudes an inex-plicable amalgamation of color, motion, energy and spirit. “A Rock of Horizontal Charm“ has transcend-ed the category of highest human sculptural attainment and entered into the enjoyments of a mystical world. Located in Covina in East Los Angeles, the H.H. Dorje Chang Buddha III Cultural and Art Museum is housed in a building with a 117-year history. The structure was renovated in 2014 and transformed into the cultural and art museum that occupies the space today. Since then, the museum’s world-class, un-matched treasures have attracted a steady stream of culture and art lovers from around the globe. The mission of the cultural and art museum is to promote the exceptional accomplishments of an Amer-ican with outstanding talent—H.H. Dorje Chang Buddha III—by displaying his achievements in culture, literature, philosophy, art, science, technology, and other fields. Visitors to the museum can learn about the noble ethics and morality of H.H. Dorje Chang Buddha III and the holy character of this magnificent, selfless Buddha who altruistically contributes to society through his vast achievements and who advances world peace as well as the happiness of people. In addition, visitors can be guided by the teachings of H.H. 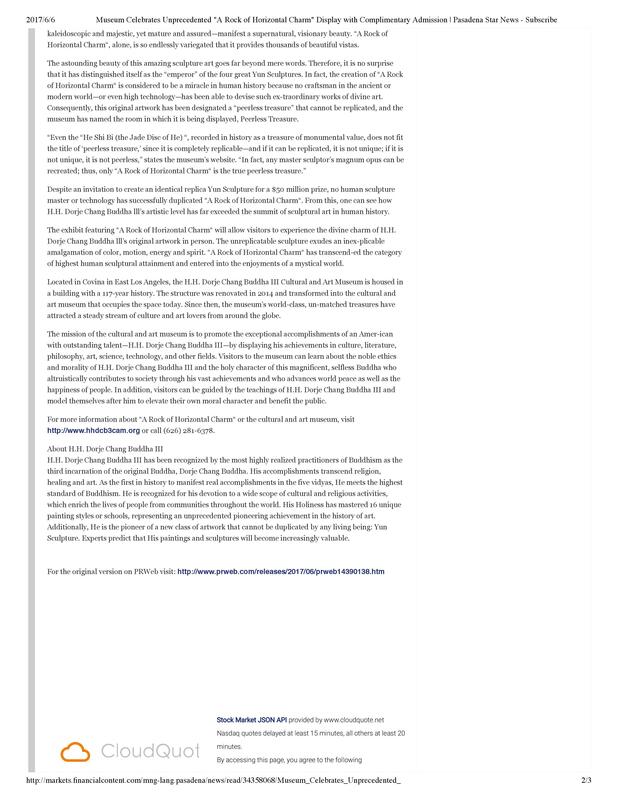 Dorje Chang Buddha III and model themselves after him to elevate their own moral character and benefit the public. For more information about “A Rock of Horizontal Charm“ or the cultural and art museum, visithttp://www.hhdcb3cam.org or call (626) 281-6378. H.H. Dorje Chang Buddha III has been recognized by the most highly realized practitioners of Buddhism as the third incarnation of the original Buddha, Dorje Chang Buddha. His accomplishments transcend religion, healing and art. As the first in history to manifest real accomplishments in the five vidyas, He meets the highest standard of Buddhism. He is recognized for his devotion to a wide scope of cultural and religious activities, which enrich the lives of people from communities throughout the world. His Holiness has mastered 16 unique painting styles or schools, representing an unprecedented pioneering achievement in the history of art. Additionally, He is the pioneer of a new class of artwork that cannot be duplicated by any living being: Yun Sculpture. Experts predict that His paintings and sculptures will become increasingly valuable.